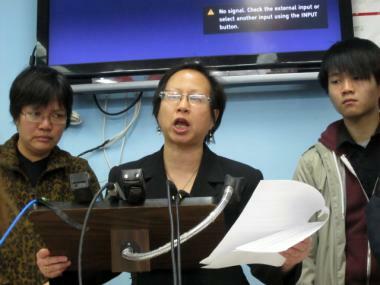 Elizabeth OuYang (center), president of OCA-NY, an Asian American advocacy group, stands with Su Zhen Chen, Danny Chen's mother, and Banny Chen, Danny's cousin, at a press conference March 6, 2012. 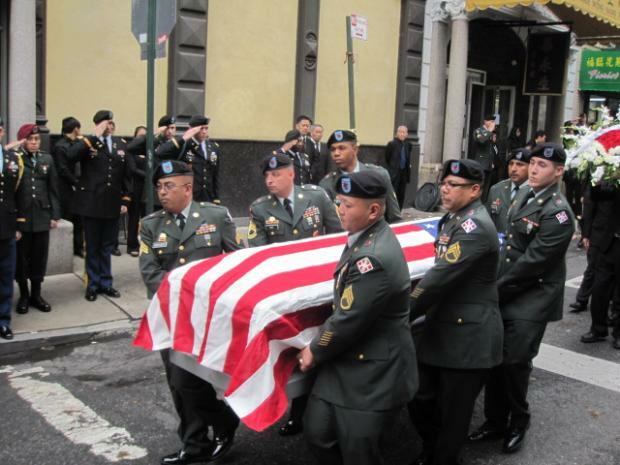 CHINATOWN — The military moved to drop the most serious charges against the soldiers accused of driving Pvt. Danny Chen to suicide in Afghanistan — enraging advocates who have been calling for the soldiers to face the harshest possible punishment in the teen's death. After reviewing evidence at a hearing in Afghanistan Monday, Army investigators recommended dropping involuntary manslaughter charges that would have carried a maximum penalty of up to 10 years in prison, military officials and advocates said. Investigators did recommend that the four soldiers face courts-martial on a series of lesser charges, including criminally negligent homicide, which carries a maximum penalty of up to three years in prison, officials and advocates said. Chen, 19, a Chinatown native, died of an apparent self-inflicted gunshot wound while serving in Afghanistan in October. Before his death, his fellow soldiers allegedly pelted him with rocks and taunted him with racial slurs while superiors turned a blind eye. Eight soldiers in all were charged in connection with Chen's death, including five who were initially charged with involuntary manslaughter, the most serious offense. One of those soldiers, Spc. Ryan Offutt, already had that charge dropped after facing a military hearing in January. The remaining four soldiers initially charged with involuntary manslaughter — Staff Sgt. Andrew VanBockel, Sgt. Jeffrey Hurst, Sgt. Adam Holcomb and Spc. Thomas Curtis — faced hearings in Afghanistan Monday. Assuming that higher-ranking military officials concur with the investigating officer's recommendation, those soldiers will not face involuntary manslaughter charges either. In addition to criminally negligent homicide, investigators also recommended that the four soldiers face courts-martial on charges of maltreatment, reckless endangerment, dereliction of duty and violation of a general regulation, Army officials said. Curtis was additionally charged with assault, and Holcomb was additionally charged with assault and communicating a threat. At a press conference in Chinatown on Tuesday, Chen's relatives said they were baffled by the Army's decision not to pursue the involuntary manslaughter charges. "We are very disappointed with the recommendation that the charges of involuntary manslaughter be dropped," said Banny Chen, Danny's cousin. Banny Chen then strongly urged the Army to hold courts-martial of the accused soldiers in the United States, rather than in Afghanistan, so that the proceedings are more transparent than the overseas hearings have been so far. "We don't just want to be given the results," said Banny Chen, flanked by his cousin's grieving parents. "We want to know what happened." Speaking in Cantonese through an interpreter, Yan Tao Chen, Danny's father, said he was also disappointed with the Army's decision. Danny's mother, Su Zhen Chen, quietly wiped away tears as advocates showed a video with photos of Danny growing up. If the courts-martials were to be moved to the United States, they will likely be held in Alaska, and the Chens would be willing to travel there for the chance to observe and participate, said Elizabeth OuYang, president of OCA-NY, an Asian American advocacy group. The first court-martial, of Sgt. Travis Carden, who is charged with maltreatment, assault and reckless endangerment, will be held April 4 in a military court in Afghanistan, but the courts-martial of the other soldiers have not yet been set, OuYang said. OuYang and City Councilwoman Margaret Chin both joined the Chens Tuesday in calling on the Army to move all the courts-martial to the United States. "There's been enough secrecy," Chin said.